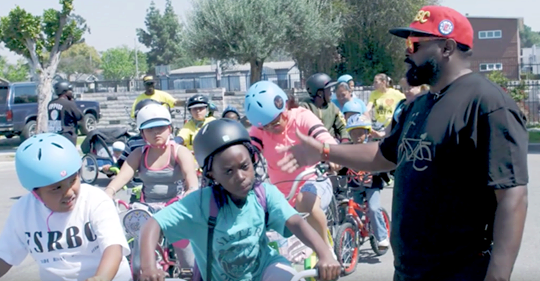 We came across this awesome, inspiring video yesterday about the East Side Riders Bike Club, "a volunteer organization in South Central Los Angeles with a mission to improve Watts through community service, charity work, and bike programs aimed at keeping local youth out of gang activity." This all-volunteer, grassroots group teaches kids how to bike safely, provides helmets, teaches bike repair, and leads weekly rides. Please take a minute to watch the video, and show it to your kids. Their Facebook page is full of videos of their Friday night rides, bike repair classes and more. Consider a donation or purchasing some of their cool swag to support their critical work. FXCC campers and counselors on the trail. Check out this heart warming story about a boys' high school mountain bike team whose members were all born overseas. These boys have very few advantages, but have built their own bikes and are learning to ride, race and have fun as part of a team.